Quality begins in front of the lens, and as is generally known, that is where the filter is. A filter must not restrict the performance of the photographic lens. 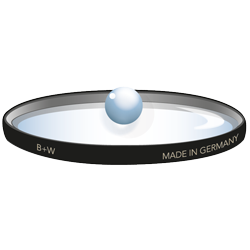 An important criteria for a perfect B+W filter is a high-quality coating, also known as an antireflection coating. With a B+W filter, such layers are evaporated by means of thin-layer technique, a quite complex coating process. The coating material consists of special substrates that are applied in one or more layers depending on the coating system. A coating changes the reflection properties of an optical surface as in our case of the filter glass. An uncoated glass surface reflects about 4% of the incident light rays on each glass surface. The system of thin, vaporized layers is configured in such a way that less light is reflected and more light passes through the layer itself and the glass. In this way, higher light transmittance is obtained which enables brighter colors and higher image contrast to be achieved. B+W filters are always coated on both sides. Consequently, ghost or double images, which can be caused by back-reflection from the image sensor, are attenuated many times and, depending on the shooting situation, completely eliminated. With the B+W single layer E coating, the light reflection on the filter surface is reduced to an average of less than 2%. With perfected multi-layer systems such as the B+W Multi Resistant Coating MRC and MRC nano, this residual reflection is well below 0.5% and is thus practically reflection-free. In an uncoated filter, or one coated with the B+W single layer E coating, the water droplet remains flat. A dirt and water-repellent effect does not occur. 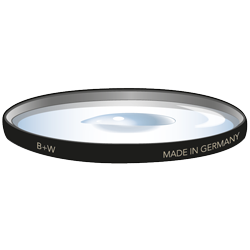 In the MRC coated B+W filter, the water droplet takes on a rounded shape. It beads away from the surface. A dirt and water-repellent effect occurs. In the MRC nano coated B+W filter, a water droplet remains practically spherical. It rolls over the surface. A first-rate dirt and water-repellent effect occurs.